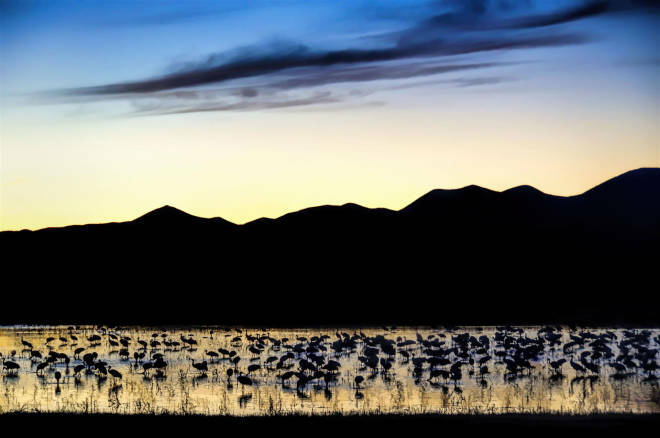 Above: Sandhill cranes gather at the Bosque del Apache in this image, a submission to our 2017 Photo Contest. Photography by Michael Garcia. Janice and I arose early on Christmas morning and, without waiting to open our gifts, got in her car and headed for the levee which runs parallel to the Río Grande, a mile or so east of Socorro, where we hoped to see many birds eating their Christmas breakfasts and to hear them singing their Christmas carols. … We left the car while we walked over to the river on a finger of land that formed an elevated path to the shoreline. As we neared the water’s edge a flock of gulls swooped over us as if they were a formation of airplanes sent out from Birdland to give us an official greeting. … A meadowlark sat on a fence across the ditch, facing the sun as if to show off his yellow suit and black necklace to their best advantage. He began to sing. From his throat came glorious music that filled the air. Joy to the world! All the Earth seemed to hush until his song was done.